This weekend we finished the last big project for the Master Bedroom and I am so in love with the dressers that we made. 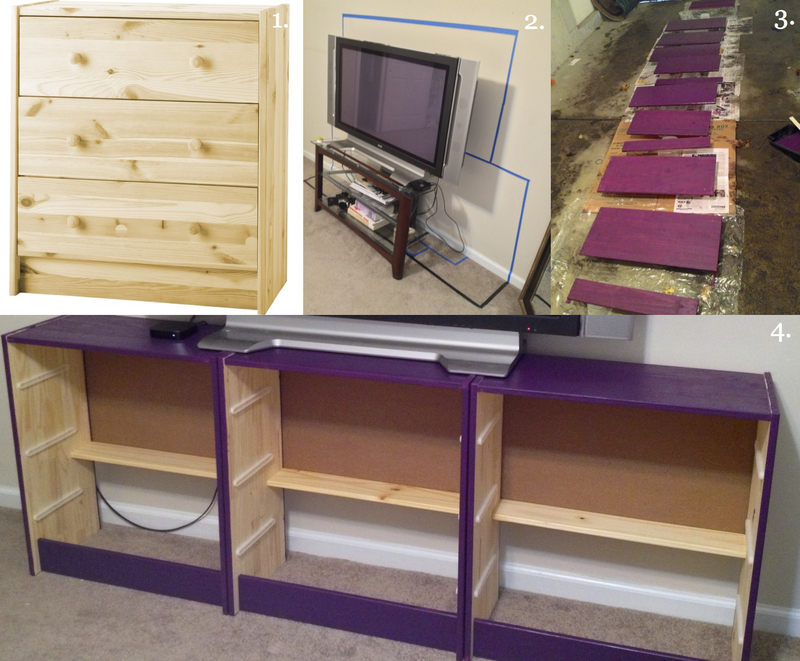 I’m sure some of you have heard of the Ikea Rast Hack… if you google it there are literally hundreds of ways to paint and decorate these super plain dressers from Ikea. We decided on three sets of the dressers pushed together to create one giant one that really makes a big impact in the room. As I mentioned before, we haven’t had a dresser in our room since we moved into this house three years ago. Our old one got dropped when we were moving in so we opted for a set of cubes with fabric bins instead. I liked that (a lot actually) but when we were planning the new room I decided on a dresser not because I actually wanted a dresser but because I knew with a lot of work it would be a huge decorative statement. 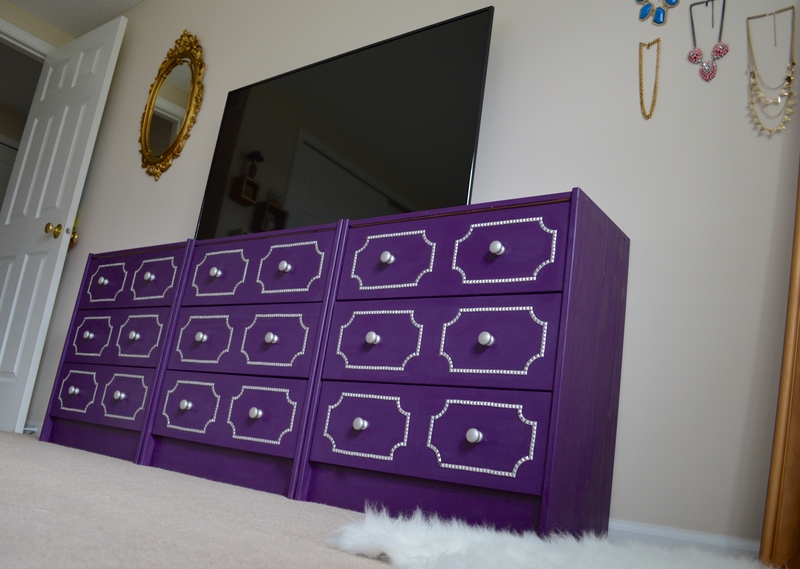 We painted the dressers and added a studded trim in scalloped rectangles on the drawer fronts giving the illusion that there are more drawers than there actually are. This project was by far the most time-consuming (we spaced it out among the last 3 weekends) and thankfully my husband was super patient with me. Between the painting, building, trimming almost 1,500 studs, glueing on the trim and then all the touch-ups he was a trooper (although I’m guessing we’ll never make another dresser ever lol). I have one more big project to share with you after this one (the velvet tufted headboard) and then I will do a post on the finished room! We started off by getting the Rast dressers from Ikea (1). A couple of things about these dressers… they are a great price ($39.99 each) because they come unfinished with the intention that you’ll paint them the color you want but they are WAY smaller than you think they’re going to be. What I did before we started buying pieces of furniture for the room was take the measurements and tape out where the new stuff would go (2). I had originally planned on getting two of the dressers but after taping it out I quickly realized these dressers were a lot smaller than I thought and that in order to hold our 46″ tv without it hanging over the edge we would need a third dresser.We took all of the outside pieces for the three dressers (two sides, a top and the kick plate at the bottom for each dresser) and painted them first. We used Valspar’s Paint and Primer in One with a satin finish in the color “Plum Good”. I got the quart size and we did 3 coats on all the dresser pieces, drawer fronts and touch ups and we still had some left over. Roll on a thin first coat on the sides that face out and the edges using mini rollers (3) and let dry completely which takes no time at all. Paint a second coat and let dry completely… you could probably get away with two coats but I decided to do three just to be safe. Once all the pieces are COMPLETELY dry, build the outer shell of the dressers (everything but the drawers) and push them all together (4). You’ll notice that where the sides of the dressers meet the tops there’s some bare spots which we’ll fix later on but you will need to paint strips inside where the drawers don’t cover. I used a small paintbrush and painted from the front edges to a little bit past where the tracks start. We did all of this one weekend and then took the next two weekends to do all the drawer fronts and touch ups. The drawer fronts were much quicker to paint, I did them inside on a tarp using tupperware containers to prop them up and I did it using disposable foam brushes and paint in a plastic container to save on clean up. Again, I did three coats of paint just to be safe. You can choose any design for the front of the drawers but I wanted to make the dresser look even bigger by adding two scalloped rectangles to each front to give the appearance of double the amount of drawers. I’m sure there’s a million ways to make a template for this but here’s how I did it. I won’t bore you with the math and how we figured out the measurements so that you could fit two rectangles on the front with an even border and space in between because honestly it was mostly trial and error. We came up with two 9″ x 5″ rectangles but then we needed to add the curved edges, so here’s what I came up with. 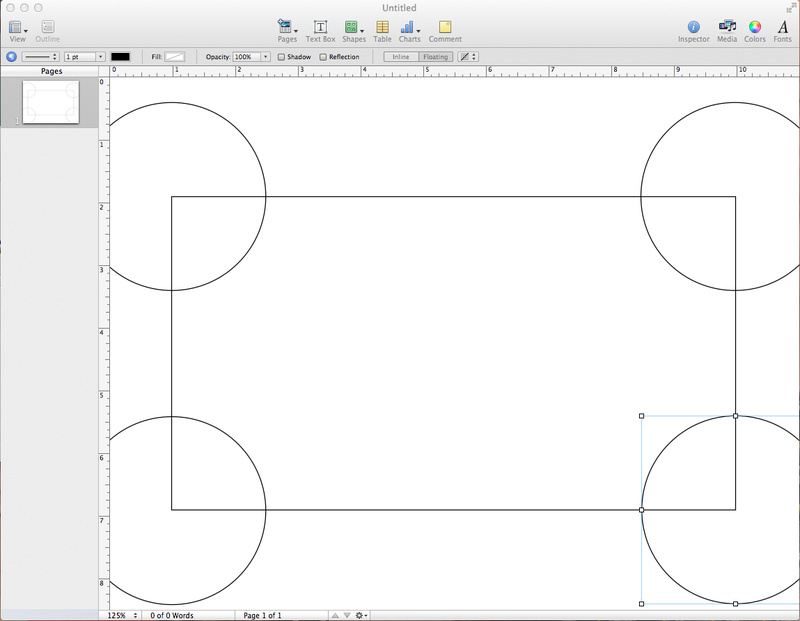 Open your computer’s word processing program and make a rectangle that’s 9″ x 5″, then add four 2.5″ circles (you can make the circles whatever size you like, we played around with 2″-3″ ones and liked 2.5″ best). Line up the circles so that two of the points hit on two sides of the rectangle as seen in the bottom right circle in the picture below. Print this onto card stock, cut out, find the center point and punch a hole… this hole will be your guide because you’ll line it up with the holes in the drawer fronts where the pulls go. My intention was to decorate the drawer fronts with “nail head trim” but I still couldn’t feel my thumb after making the Nailhead Trim Cube Table so I started thinking of a different option. I really liked the look of the iPhone case I made and decided a single row of those studs would look cool on the dressers. I had a few yards of studs that I got a couple months ago for yet another project I have not had the time to do, but they were gold and my husband had chosen silver for the dresser. My solution- silver leaf paint which is AWESOME by the way. The studs come from Joann Fabrics, though they never have them online. It’s a 2 inch strip with 6 rows of studs sold by the yard and you can find it in the trims section… it comes in silver and gold, though the finish is super shiny so even if I had the silver color I probably would have painted it anyways to get the matte look. Paint it before cutting the studs apart (1) because it is much easier than trying to paint each one individually (I also painted the plain wooden drawer pulls that came with the dressers). Here’s where we made much more work for ourselves… I like the cut the studs apart and then trim the little pieces around all 4 edges (yes we did this for all 1,500 studs we used!) but if u don’t mind the spacing you could just cut the studs into strips like I did for the second studded strip pillow in this post. Once the paint is dry and you have your studs cut (it takes about 80 for each rectangle, so about 160 for each drawer front), trace your template onto the drawer front. You’ll match up the holes, make sure you’re template is straight (2) (level it with a ruler at the top) and then trace it (3). Use E600 glue, working in small sections at a time to glue the studs along your template line. The curves take some time to get used to… do the straight lines on either side first then just curve 5 studs along the line to match up (4)… the first couple are tough then it’s easy. Once the two rectangles are studded on the front, let the glue finish drying for about an hour then build the drawers according to the instructions and add the now silver drawer pulls (5). 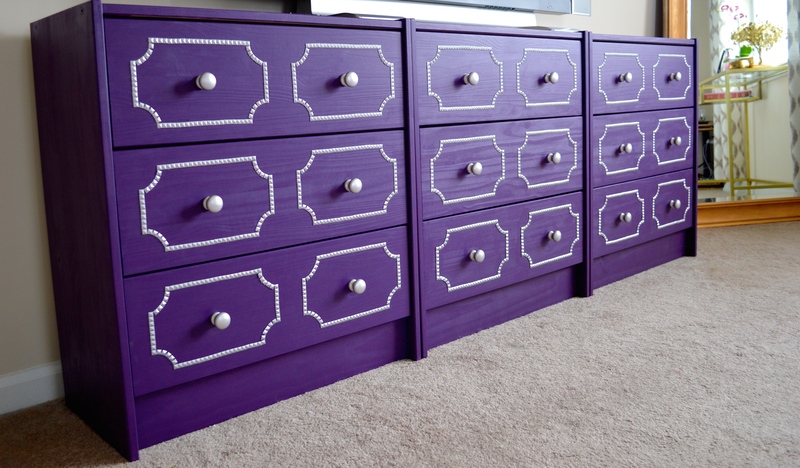 There will be little spots here and there that need touching up as well as smudging from the paint and the pen so once you have the drawers in place just take a small paint brush and touch up the drawers with the purple paint to give them a flawless look(6). Once all the drawers are in you have a better sense of what is going to show and needs touching up with the paint. For us it was where the sides of the dressers met the tops, the front edges and the kick plates. Use a small paint brush and touch these spots up, using a couple coats if needed. I also painted over the screws on the two sides that were on the outside. It seems like a lot of work, and it is, but spreading it over a few weekends made it a lot more manageable. When all was said and done we ended up paying less than $150 for all three dressers, the paints, the studs and supplies which if you’ve ever shopped for a dresser is a STEAL especially considering that it’s totally custom and really impressive! I plan on switching out the plain drawer pulls for some cool ones but I haven’t found exactly what I’m looking for yet… I’ll keep you posted! **UPDATE: See this dresser in the completed Master Bedroom HERE. Thanks! I have never decorated with purple before, my husband actually picked the color and I am loving it! I bet it looks fantastic in your living room! I was truly inspired by your dresser and painted my own the same color!!! I’m so glad to hear it inspired you!! Love that purple! The whole thing looks really great. I wish I could convince my husband to give purple a try! Thanks I’m loving the color too…. definitely different! We didn’t! We went back and forth deciding if we should/how we could and ultimately decided to give it a go not attaching them. We figured that way we could separate them later and paint them different colors if we wanted to a few years from now. We were worried about having the tv on them without them being attached but it’s been almost a year since we put them up and we haven’t had any issues!